Wagiha Hallouda and I after the interview. 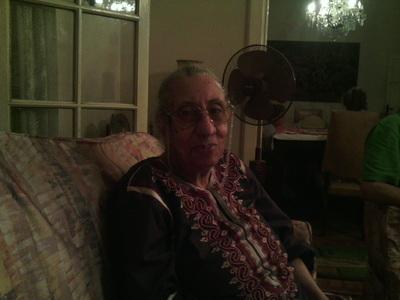 Wagiha Hallouda, graduated with a degree in Journalism from the American University in Cairo in 1969 at the age of 40. After finishing high school in 1945, some Egyptian traditions made her quickly get married at the age of 16 and pregnant with her first born by the age of 19. This made her register for AUC at the age of 36. She chose to major in Journalism because her English was never an asset; eliminating the likes of Political Science for example and her primary focus was on translation. Directly after graduating AUC; she worked as a translator in the Ministry of Knowledge and a year later, she joined the AUC staff as a professor in the Arabic language department for 25 years. Her time at AUC made it easier to connect with her children, who were all either in universities or on the verge of becoming university students. The fact that she was surrounded all the time with peers at the same age as her children made her understand how they saw life and was able to build a formidable bridge of communication, understanding and trust with her children. She does not regret getting married at the age of 16 because she loved her husband very much and was grateful for being blessed with children early on in her life. It was the support of her late husband and children that made her seek further education. She says without them believing in her she would have stayed at home. Here is a short excerpt of the interview. 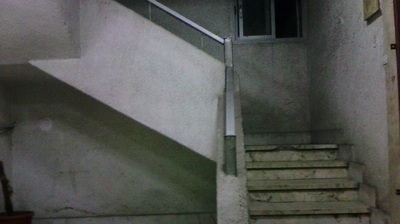 And I am climbing the stairway to Wagiha's house. Wagiha Hallouda before the interview.